This page will contain all the latest Pat Riley News That You Can Use! As more stuff comes in, this page will be promptly updated. Now for our first bit of news, the following item was from Liz Smith's gossip/celeb suckup column on Tuesday 10/20/98. It seems that the folks at "GQ" magazine are some of the smartest people out there, as they have once again named Pat Riley Stylish Man of the Year! The "GQ" awards will be presented on Wednesday 10/21 in NYC, but we don't know if Pat will attend, what with the crappy way so many people in that city have treated him. Anyway the festivities will be broadcast on VH1 later this month: GQ MAGAZINE, which is all about how to have a manly lifestyle, holds its annual Men of the Year Awards tomorrow night at Radio City Music Hall. The list of winners is always top secret, but we have it, natch. The magazine picked comic Chris Rock ... fashion divo (a male diva) Tommy Hilfiger ... music icon Sting ... super-actor and box-office champ Harrison Ford ... boxing gods Muhammad Ali and Evander Holyfield ... literature's James Ellroy ... Titanic director James Cameron ... theater and Star Trek star Patrick Stewart ... our favorite surgeon, ER star George Clooney ... TV's handsome man of many questions, Matt Lauer ... and chef Emeril Lagasse, whose cooking show is so hot. (Bam!! as Emeril would shout, as he tosses his famous essence on this or that dish.) Pat Riley is deemed GQ's all-round most stylish. These guys will be presented with their awards by the likes of Cameron Diaz, Madonna, Tyra Banks, Willem Dafoe, James Earl Jones and The Artist Currently Known as Pretentious (Prince). Seal and Paula Cole perform. The GQ Awards will be broadcast on VH1 Oct. 31. 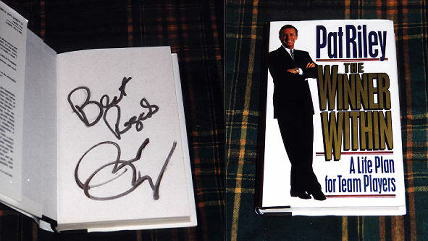 Wanna Buy Some Autographed Pat Riley Stuff? http://www.ebay.com: Just plug in his name in the search box and bid away! I do not have anything for sale there nor do I make any money from it. I just provide this info for your convenience. Just a reminder to sign up for the FREE Pat Riley Fans mailing list, to get a little bit of Pat in your mailbox every day!